Dreaming of charging the bar, arriving at the grounds and setting a spread just as the sun breaks the horizon? Do it in Bar Crusher’s new 640HT (Hard Top)! Constructed from pre-stressed 5mm (bottom sides) and 4mm (top sides) marine grade plate aluminium, Bar Crusher’s super-tough flagship model – with its high-tech Waveslicer™ non-pounding, deep-V hull and maximum-strength Rigideck™ sub-floor system – will have you safely across the bar while everyone else is still at the ramp. Measuring 6.85m LOA, beam 2.47m, the 640HT’s toughened safety glass windscreen and all-weather hard top allows full standing room and an unobstructed 360° view from the helm to keep an eye on prevailing conditions, and search for working birds and feeding fish. If laying a berley trail for sharks or cubing for tuna, you’ll find the big Bar Crusher’s stability at rest is second to none – the result of the manufacturer’s exclusive Quickflow™ water ballast technology. A cavity that runs the full length of the keel quickly fills with water when stationary, which lowers the chines into the water for greater stability, and drains in seconds as the boat moves forward allowing it to leap effortlessly onto the plane to chase a rampaging fish. The spacious cockpit will also make tagging, gaffing and handling fish a breeze. Rated to carry a 150-200hp outboard, the 640HT’s outstanding ocean-going capabilities, 300lt fuel capacity, comfortable driver and passenger seating, folding rear seat and spacious V-berth make it an ideal boat for anglers looking to venture further offshore in search of much bigger fish. A very impressive list of standard features includes hydraulic steering, self-draining deck with scuppers, step-through transom, marlin board / swim platform, rod holders, livebait tank, in-floor fish storage tank, large-volume storage pockets, dual battery system and much more. 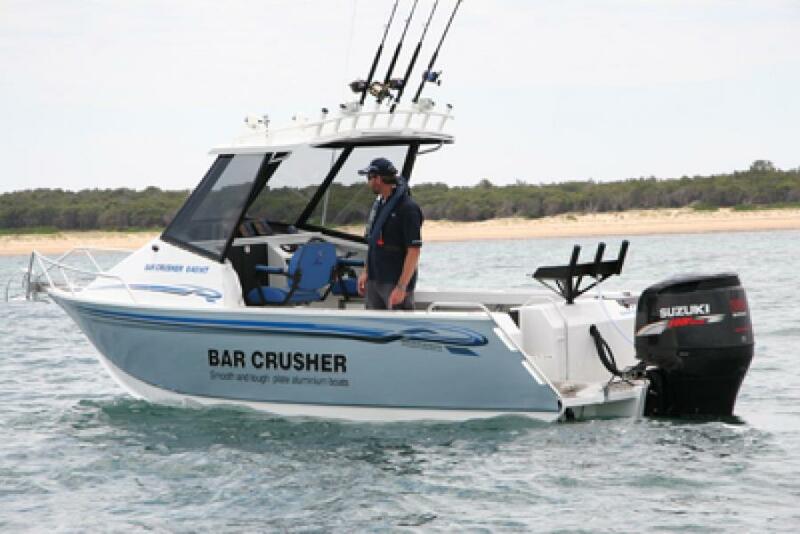 Turn your dreams into reality in a Bar Crusher boat today!